Citroën is introducing a nautical new special edition of the best selling sub 110g/km CO2 emitting car in Europe. The C1 Splash will benefit from extra equipment like air conditioning, front electric windows and remote control central locking, as well as two funky new body colours exclusive to Splash. Customers can style their C1 Splash in the new colours – metallic Electra Blue or Lipizian White. In contemporary contrast to the striking body colours, the Splash will be fitted with custom coloured door mirrors; Lipizan White models will feature metallic black mirrors and the Electra Blue will have white door mirrors. The frugal C1 Splash’s outstanding fuel economy (62.8 mpg on combined cycle), ultra low CO2 emissions of just 106g/km and group 1 insurance make it the ideal city car to cruise through the credit crunch. At under 111g/km CO2 it also qualifies for 100% first year write-down when bought as a company car. 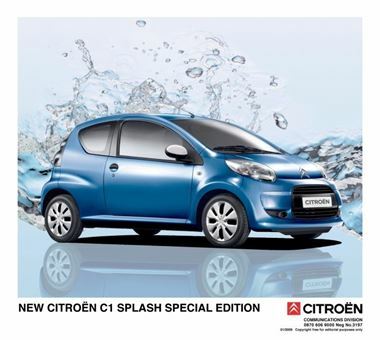 The C1 Splash is based on the new 1.0i 68hp VT model and is available with 3 or 5 doors. Available from just £7,345, including a generous £800 cashback offer, it’s only £550 more than the VT and stacked with extras.